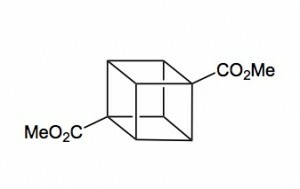 Cubane (C8H8) is a synthetic hydrocarbon molecule that consists of eight carbon atoms arranged at the corners of a cube, with one hydrogen atom attached to each carbon atom. A solid crystalline substance, cubane is one of the Platonic hydrocarbons. It was first synthesized in 1964 by Philip Eaton, a professor of chemistry at the University of Chicago. Before Eaton and Cole’s work, researchers believed that cubic carbon-based molecules could not exist, because the unusually sharp 90-degree bonding angle of the carbon atoms was expected to be too highly strained, and hence unstable. Once formed, cubane is quite kinetically stable, due to a lack of readily available decomposition paths. The other Platonic hydrocarbons are dodecahedrane and tetrahedrane. Cubane and its derivative compounds have many important properties. The 90-degree bonding angle of the carbon atoms in cubane means that the bonds are highly strained. Therefore, cubane compounds are highly reactive, which in principle may make them useful as high-density, high-energyfuels and explosives (for example, octanitrocubane and heptanitrocubane). Cubane also has the highest density of any hydrocarbon, further contributing to its ability to store large amounts of energy, which would reduce the size and weight of fuel tanks in aircraft and especially rocket boosters. Researchers are looking into using cubane and similar cubic molecules inmedicine and nanotechnology. In the next step, the endo isomer 2.3 (with both alkene groups in close proximity) forms the cage-like isomer 2.4 in a photochemical [2+2] cycloaddition. The bromoketone group is converted to ring-contracted carboxylic acid 2.5 in a Favorskii rearrangement with potassium hydroxide. Next, the thermal decarboxylation takes place through the acid chloride (with thionyl chloride) and thetert-butyl perester 2.6 (with t-butyl hydroperoxide and pyridine) to 2.7; afterward, the acetal is once more removed in 2.8. A second Favorskii rearrangement gives 2.9, and finally another decarboxylation gives 2.10 and 2.11. The cube motif occurs outside of the area of organic chemistry. Prevalent non-organic cubes are the [Fe4-S4] clusters found pervasively iron-sulfur proteins. Such species contain sulfur and Fe at alternating corners. Alternatively such inorganic cube clusters can often be viewed as interpenetrated S4 and Fe4 tetrahedra. 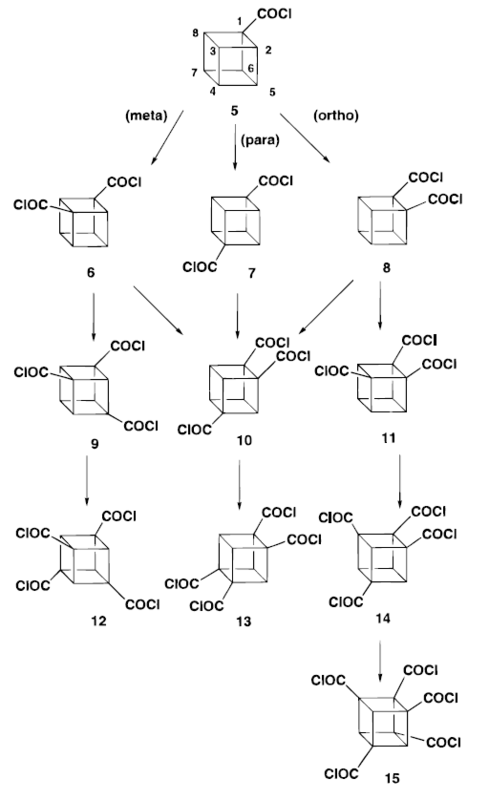 Many organometallic compounds adopt cube structures, examples being (CpFe)4(CO)4, (Cp*Ru)4Cl4, (Ph3PAg)4I4, and (CH3Li)4. Since the synthesis of the cubane-1,4-dicarboxylic acid has become shorter and easier, a new decarboxylation method has also devised to give increased yields of the final cubane product. This has allowed the scale of production reach multikilogram batches in places (Fluorochem in California and EniChem Synthesis in Milan) eventhough cubane and its derivatives remain expensive to purchase. Cuneane may be produced from cubane by a metal-ion-catalyzed σ-bond rearrangement. Cubanehas the highest strain energy (166kcal/mol) of any organiccompounds available in multi gram amount. It is a kineticallystable compound and only decomposite above 220 Celsius Degree.It is also one of the most dense hydrocarbons ever know.However, although many physical properties of cubane have been measured, in1980 and before, cubane was considered just a laboratory curiosity of interest only to academics.It changed, in early 1980s when Gilbert of U.S ArmyArmament and Development Command (now ARDEC) pointed out that cubane’svery high heat of formation and its exceptionally high density could make certain cubanederivatives important explosives. The effectiveness of an explosive is dependent on the energentics of the decomposition reaction,the number of moles and molecular weight of the gaseous products and also the density. The more mols of of an explosive that can be packed into the limited volume the better. . Highly nitrated cubanes can be predicted to be very dense and very powerful explosives. Octanitrocubane is calculated to be 15~30%more powerful than HMX. Cubane, which CA index name is Pentacyclo[4.2.0.02,5.03,8.04,7]octane (7CI,8CI,9CI),has exceptional structure, strain and symmetry and it is a benchmark in organic chemistry.It has been studied extensively and much of its properties has been published.Some of the physical properties are given at right hand table. C-C bond length in a simple cyclobutane. The cubane system was first synthesized over 35 years ago by Philip Eaton and Tom Cole. 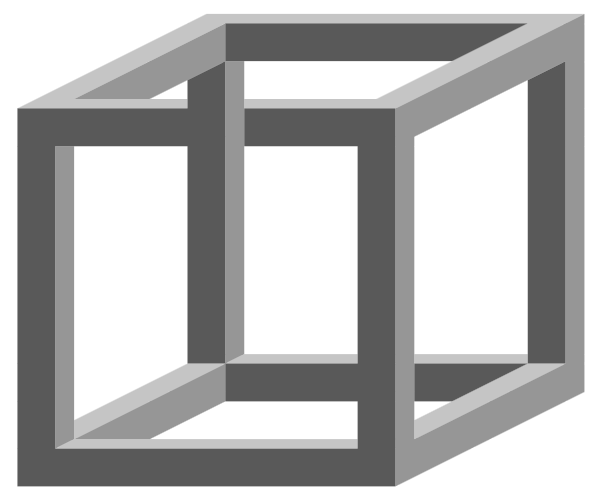 It is a highly symmetric cubic cage structure having carbon atoms at the vertices of a cube. dimer I and cubane-1,4,dicarboxylic acid. It is a marvel scheme of economy and simplicity. method for large-scale synthesis of cubane-1,4,dicarboxylic acid. this work and improved this synthesis. is that there are no kinetically viable paths along which cubane can rearrange thermally. only a small change in geometry, and the resulting biradical is still very strained. Functional groups on the cubane system generally behaves very well.Functional group transformation can be applied successfully.For example, the preparation of 1,4-dinitrocubane from cubane-1,4-dicarboxylic acid. (The mechanism is provided on the right hand side.) Classical methodology is used here. Substitution on the cubane framework is fairly easy done by the cubyl radical. However, the problem is such that a mixture of products are obtained. we need to carefully study the chemistry of the cubane system. This is the improved synthesis by N.B Chapman et al in England. 2-bromocyclopentadienone could be made easily and undergoes spontaneous dimerization. The rest of the reaction is the same as the original one. Flurochem in California and EniChem Synthesis in Milan. prepared easily from cubane-1,4-dicarboxylic acid. Cubane is a colorless solid. It melts at 130- 131°C, and decomposes above the melting point. It is soluble in CS2, CC14, CHC13, and benzene. Spectra were obtained from 400 to 3600 cm-l with a Beckman IR-12 spectrophotometer. 200-400 cm-l was not examined for the other compounds. The spectral slit widths were 1-2 cm-l in all cases. 4000 to 660 cm-1appear at 300,1231, and 851 cm-1. and only absorption appears at chemical shift=6.0ppm. Originally there was doubt whether cubane does exist. The geometry at each carbon atom is far from tetrahedral. the thermal rearrangement of cubane. the energy of concerted two-bond ring-opening reactions is very high. electronic,structural, and dynamical properties compared to the other hydrocarbons. solid cubane are dominated by the properties of the C8H8molecule. Because the cubane frame is rigid, substituent have precise spatial relationships to each another. been obtained which shows interesting activity in anti-AIDS and anti-tumor screens. system is not inherently toxic. Most of cubanes are biologically innocuous. can install a wide range of substituents in a variety of well defined special relationships. Developments in drug design programs should allow the judicious choice. which causes AIDS, without impairing healthy cells. can be used to permanent information storage. Another example of UV active cubane, which can be used to synthesis liquid crystals. The cubane subunits in these polymers can be rearranged easily to cycloctatetraenes. which are enhanced by the chain being intrinsically part of another polymer. Cubane derivative could be the structural basis for a class of intrinsic small gap polymers.The small gap polymer could present intrinsic good conductivity without doping,good nonlinear optical and photoelectric properties.Investigation of oligamers with up to six units of a conjugated unsaturated cubane derivative,where all the hydrogen were removed, is carried out.The table below shows that the gap values in eV by EHT and PM3.These values suggest to us that these structures could be used to design a newclass of polymers with very small gap. greater than any other C, N, O compound. Is Cubane a really good explosives? Quantitative evaluation of the potential of a candidate explosive before synthesis is very difficult. weight of these gases are all critical factors. Density too is crucial. detonation velocity of an explosive. Numerous nitro compounds are employed commonly as military and commercial explosives. There is a continuing search for more powerful and less shock-sensitive examples. Such materials are also sought as potentially useful fuels and propellants. elements needed for combustion to gaseous products in the absence of air. all constituent carbon and hydrogen atoms to gaseous CO, CO2, or H2O. Each of these, along with N2, “explodes” from the solid to 12 gaseous molecules. such “low-signature” rockets are difficult to track. The key intermediate, cubane-1,3,5,7- tetracarboxylic acid (TNC), was obtained by clever application of the Brown-Kharasch photochlorocarbonylation to cubane mono-acid. The addition of four further nitro groups proved far more difficult and new methodologies had to be developed, specifically the process of interfacial nitration. 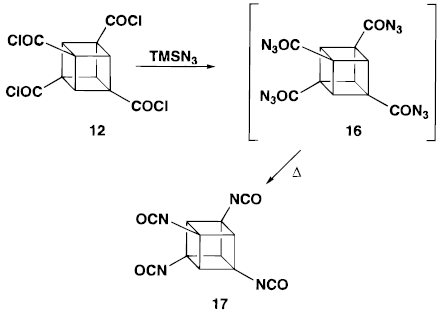 This method was used successfully to convert the sodium salt of TNC to pentanitrocubane (PNC) and then hexanitrocubane (HNC), both are stable materials. For the last planned post in my Unnatural Products series, I’m going to write about Eaton’s 1981 synthesis of pentaprismane. [A] At the time, unnatural hydrocarbons were hot targets, and as the next largest prismane on the list this target was the subject of much research by groups around the world. Perhaps Eaton’s biggest rivals were the groups of Paquette and Petit, and in fact all three had, at various times, synthesised hypostrophene as an intended precursor to the target. Unfortunately, the ‘obvious’ [2 + 2] disconnection from pentaprismane turned out to be a dead end and the photochemical ring closure was unsuccessful. The 1970s and early 1980s saw the publication of a number of other similarly creative, but sadly ill-fated, approaches based on various ring contractions, and the compound gained a well-earned reputation for extraordinary synthetic inaccessibility. With significant amounts of homopentaprismanone in hand, the group now intended to employ the transformation that had been the cornerstone of their cubane synthesis – the Favorskii rearrangement. Unfortunately, this required the introduction of a leaving group in the ketone α-position, a transformation made incredibly difficult due to the strained system and Bredt’s rule, which prevented enolisation. [C] Eventually a six-step sequence (!) to introduce a tosyloxy group was devised, beginning with a Baeyer-Villiger reaction using m-CPBA. A remarkable CH oxidation with RuO4, generated in situ, then gave the hydroxylactone. Treatment of this with diazomethane gave the corresponding δ-ketoester in almost quantitative yield. The group then reformed the starting norbornane-like bridge through use of an unusual acyloin type reaction effected by treatment with sodium in liquid ammonia. Finally, oxidation of the secondary alcohol and tosylation gave the Favorskii precursor, apparently preparable in muti-gram quantities. A J. Am. Chem. Soc., 1981, 103, 2134. Much like Eaton’s seminal cubane paper, the title is a single word, ‘Pentaprismane’. I love the lack of hype. B Although Petit had prepared this compound a full decade earlier, his approach relied on a cycloaddition of the difficult to prepare cyclobutadieneiron tricarbonyl with the acetal of tropone, and proved difficult to scale up. In fact, in his own paper Eaton rather directly described it as ‘conceptually fascinating [but] useless synthetically’. C Eaton uses the phrase ‘invasion at the bridgehead’, which I find delightfully evocative. Makes it sound like a second world war campaign. Apparently the group initially planned, in spite of Bredt’s rule, to deprotonate the bridgehead position, relying on inductive stabilisation of the anion rather than enolate formation, but were unable to do so. D Pentaprismane is the most recent of three prismanes synthesised to date, the other two being cubane, and triprismane. Although I think triprismane looks quite silly, it was actually synthesised some 8 years previouslyby T. J. Katz in far fewer steps. Go figure. The very first step of cubane frame substitution will be the activation of the cubane frame. This can be done by amides. The idea is derived from the similarities between cubane and arenes. and in both the adjacent (ortho) substituents are forced to be coplanar. reacts with excess lithium tetramethylpiperidide (LiTMP) in THF solvent. About 3% of the deuteriation products obtained. difficulty in hydrolyzed it the corresponding carboxylic acid. of the amine so produced with dimethyldioxirane or potassium permanganate (in large scale). of a great variety of the substituted cubanes. make use of the small amount of anion in the equilibrium with the starting material. Mercury salt is used here as an effective anion trap and very little starting material remain unreacted. starting material by drawing the lithiation equilibrium to the right. the amide group is again able to assist removal of another ortho-hydrogen atom. simplified by treatment with elemental iodine. 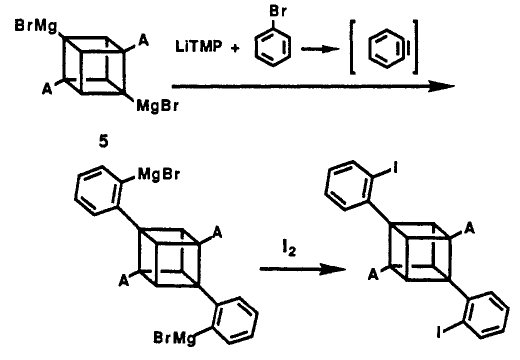 From transmetalation, a reverse transmetalation was also developed, which is basically adding Grignard reagent to the mercuriated cubane instead of the iodine. However, these processes have a great main disadvantage, the mercury is highly toxic. Thus, scale up of this method was limited. 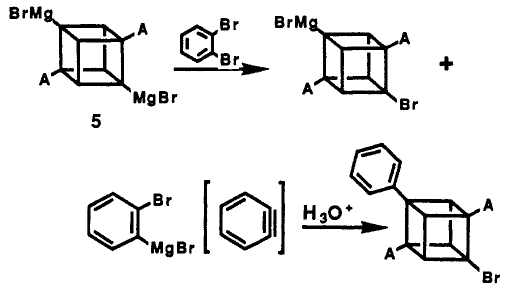 In 1988, Bashir-Hashemi introduced transmetaltion with magnesium salts and thereby provided easy access to cubyl mono-and bis-Grignard reagents. It is a reaction of cubane diamide with an excess of LiTMP/MgBR2 in THF and quenching with I2 gave diiodocubane diamide of 72% yield. When electron withdrawing group such as cynate present, they stabilize both intermediate lithiated cubanes very well. As a result, only a small amount of LiTMP is need to achieve fairly complete deprotonation even at -78°C. The inductive effect of the cyano group clearly enhances the reaction. However, the adding of cyano groups results in competitive lithiation and a mixture of products. However, this problem can be well trackled by adding MgBr2.The product ratio was improved to 9:1 favoring carboxyliation ortho to the amide function. A mixture of product formed. Since the reactivity of cubane metalation is enhanced greatly with presence of cyano groups, it is possible to substitute all three positions ortho to the amide in a simple reaction. For instance, 4-cyanocubanamide can be converted directly into the tri(tert-butylcarbonyl)derivative as shown below. Through Baeyer-Villiger oxidation, ter-butyl cuybl ketones can be converted easily to the polycarboxyliated cubane. From the basis idea of cubyl Grignard Reagent, phenyl cubane can be synthesised. The reaction of cubane diamide with 10 equiv of LiTMP and 4.0 equivalents of MgBr2 etherate in THF at 0°C followed by the addition of 10.0 equiv of bromobenzene, gave diphenylcubane diamide in 53% yield. The benzyne intermediate was formed in situ from the reaction of excess of LiTMP with bromobenzene. For a similar reaction, MeMgBr is used and give 30% yield of bromo-phenylcubane diamide, the first cubane derivative containing 3 different substituents. 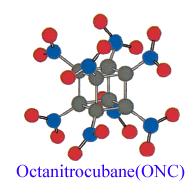 Now, let us look the main concern of the cubane derivatives–the nitrocubanes. If we want to add more nitro groups into the cubane nucleus, we cannot do it though transmetalation because there is unstoppable cage cleavage reactions when make adjacent nitro groups. The ab initio calculation has confirmed this destabilising effect. We are going to discuss how to make more and more substituted nitrocubane until octanitrocubane(ONC), the ultimate power house, is synthesised. As we mention early, addition of nitro groups cannot be done through direct transmetalation. Thus, we need found some indirect route. This is done by introducing a substituent on each of 3 ortho carbons and remove the ortho-activating group in the end. By adding a electron-withdrawing group such as a cyano group will help the case here. This choice of original substituent is important here and when cyano group is chosen, it activates the cubane nucleus without affecting the ortho directing by the diamide (for details please refer to electron-withdrawing group-cyanite). When the dicyano amide was treated with TMPMgBr in THF and quenched with CO2. The ortho (to amide) carboxylic acid was the only product. Even when the much activated tricyanoamide is treated with TMPMgBr and CO2 ,again, the ortho position ( to amide) carboxylic acid was formed. The removal of the carboxamido group is done through a smart yet tedious process. The cyano group is converted to acid group first. Then, it is reduced to alcohol by lithium aluminium hydride. At same time, the carboxamido is reduced to aminotetrol. The alcohols are protected as acetates and amino tetrol is converted to carboxylic acid. The carboxylic is then removed through Barton Decarboxylatio. A detail mechanism is provided below. The whole process is very clever, but it is very long. 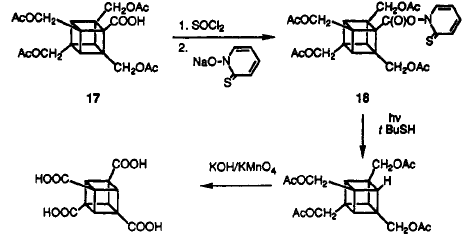 Thus, in 1997, a improved synthesis method for TNC was proposed by making use of the photochemsitry. In 1993, Bashir-Hashemi showed the cubane-1,3,5,7-tetracarboxylic acid chloride can be formed by applying photochemically induced chlorocarbonyl cation( the Kharasch_Brown Reaction). For a fast reaction, a high power Hanovia of 450 watts, medium pressure Hg was used. The favoured products are cubane tetraacid chloride shown on the right hand side. The first one, cubane-1,3,5,7-tetracarboxylic acid, made up 30% overall. 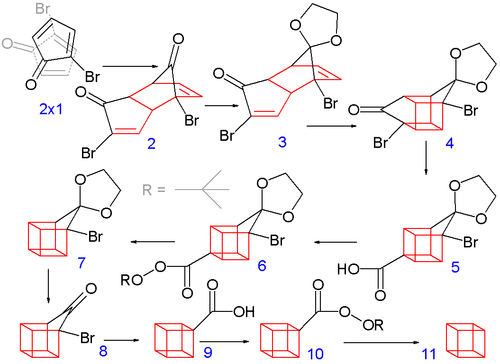 This reaction conveniently prepare us the important versatile intermediate . A catalyst TMSN3 is used in converting tetraacid chloride to tetracylazide. The rest is the same as the orginal reaction. TNC is a thermodynamic powerhouse but remarkly stable kinetically. Figure 1 shows that rapid thermal decomposition doesnot start until over 250°C. The literature was unsupportive of this optimistic view. Poor results were also obtained initially with nitrating agent such as NO2BF4, acetyl nitrate, amyl nitrate etc. Tetranitrocubylsodium can be formed directly on treatment of TNC with sodium bis(trimethylsilyl) amide in THF at -75°C. It can react with electrophiles to provide a useful and convenient way to achieve further functionalization of cubane nucleus. 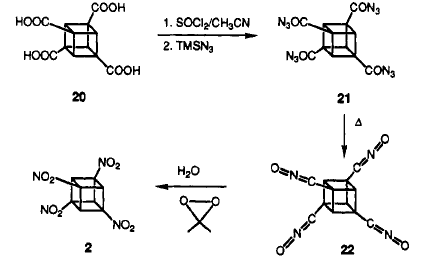 Base on the property of tetranitrocubylsodium, nitryl chloride(NO2Cl) was used to further nitrate the cubane nucleus. 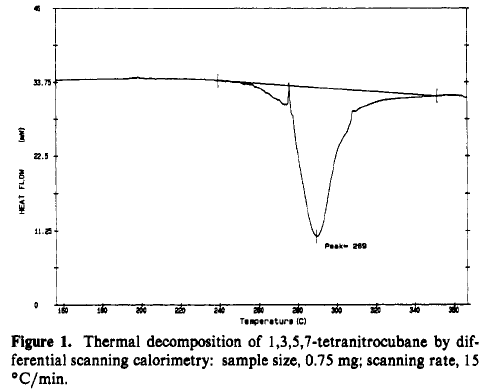 Treatment of NO2Cl with tetranitrocubylsodium in THF at -75°C works out 10-15% yield of pentanitrocubane(PNC). The yield increased to 30% when the solution was frozen to-180°C and allowed to warm slowly. This is called the interfacial nitration process. It is suggested that NO2Cl oxidized tetranitrocubylsodium to a radical, which made the whole reaction worked. 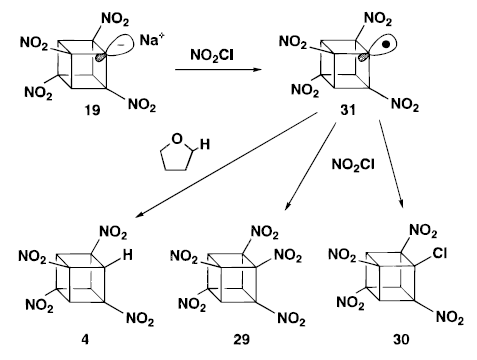 Base on the property of NO2Cl , N2O4 should be a better choice. The results showed that it is actually a better with 60:40 PNC to TNC ratio. The reaction is extremely clean. PNC is colourless and highly crystalline. It is the first nitrated cubane to contain adjacent nitro groups. It behaves just TNC and other nitrocubanes, remarkly stable kinetically. Although HNC can be prepared the same way as PNC, but the separation between PNC and HNC is extremely difficult. 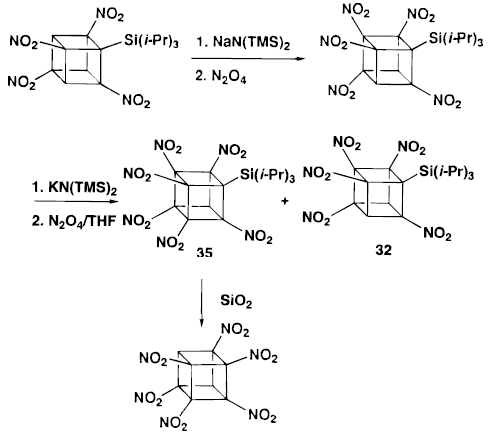 However, if TIPS-substituted PNC( by N2O4 nitration from TIPS-sub TNC) react with potassium base (K(TMSN)2and the nitration with N2O4 gave a mixture of (triisopropyl) HNC and PNC in 60:40 ratio. This step is important and crucial. The separation is now possible by column chromatography on silica gel. 30% isolated yield of PURE HNC could be obtained when further treated with SiO2. Interfacial nitration is not sufficient to further nitration for heptanitrocubane. Al though it is very good in deed, we need to find something which can successfully convert heptanitrocubane (HpNC). C giving a clear, but very viscous fluid. This was stirred vigorously as excess N2O4 in cold isopentane was added. After one minute, the base was quenched, and the whole mixture was added to water. This resulted reproducibly in almost complete conversion of TNC (1 g scale) to HpNC (95% by NMR), isolated crystalline in 74% yield! of any formation of ONC was ever seen. It is suspected that anion nitration with N2O4 proceeds by oxidation of the carbanion to the corresponding radical.Perhaps the anion of HpNC is too stabilized for this to occur. (HpNC is significantly ionized in neutral methanol.) This concept led to the use of the more powerful oxidant nitrosyl chloride. Addition of excess NOCl to a solution of the lithium salt of HpNC in dichloromethane at 78° C followed by ozonation at 78° C gave the long-sought ONC in 45±55% isolated yield on millimole scale. The intermediate product prior to oxidation is thought to be nitrosoheptanitrocubane. Finally, the magic molecule, the so called the impossible molecule, octanitrocubane was synthesised. But, how good are they and how useful are they? Let us discuss about it in the following section. Neither HpNC nor ONC is detonated by hammer blows! ‘ ‘Cubaneand Thomas W. Cole. Philip E. Eaton and Thomas W. Cole J. Am. Chem. Soc. ; 1964; 86(15) pp 3157 – 3158; doi:10.1021/ja01069a041. K. Kindler, K. Lührs, Chem. Ber., vol. 99, 1966, p. 227. An interesting OPRD paper on the scale up of dimethyl cubane -1,4-dicarboxylate. The work appeared in Organic Process Research and development, 2013, doi.org/10.1021/op400181g . It was carried out by an Australian group, John Tsanaktsidis, Michael Falkiner, Stuart Littler, Kenneth McRae and Paul Savage from CSIROand features a large-scale photochemical reaction which is very unusual to see in a scaled chemical process. 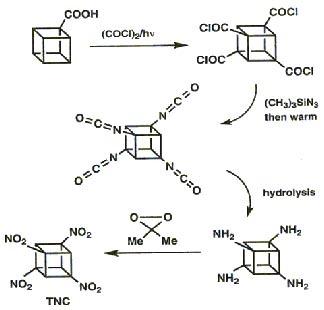 Extending their previous work from 1997, they scaled the following reaction. As is the norm with such reactions the reaction requires high dilution to be successful. In this case they used a tailor made photochemical reactor. A solution of 1 in methanol/water was pumped through the reactor at 4 L/minute and the conversion of 1 to 2 was noted as 1g/4 minutes of irradiation. This meant a total time of 173 hours. Further processing of 2 through the double Favourskii ring contraction required significant development but eventually delivered the di-sodium salt corresponding to the di-ester of cubane. One needs to be careful with these cubanes as they are, due to the highly strained nature of the system quite energetic materials, the do-acid and ester being more stable than the parent hydrocarbon. However the energy released upon warming above the melting point is not insignificant. This paper represents a good demonstration of the scale-up of several very difficult chemical reactions, including excellent descriptive paragraphs of the problems and solutions. They are to be congratulated on a very nice piece of work. A scalable process for the preparation of high purity dimethyl 1,4-cubanedicarboxylate (3) is reported. The work described herein builds on previous synthetic work from this and other laboratories, to provide a reliable process that can be used to prepare multigram quantities of 3 in a partially telescoped, 8 step process, with minimal purification of intermediates. 1H NMR δ: 3.7, s, 6H 4.24, s, 6H, ring protons. 13C NMR δ: 47.03, 51.55, 55.77, 171.89. Bashir-Hashemi, A., New developments in cubane chemistry: phenylcubanes. J. Am. Chem. Soc. ;1988;110(21);7234-7235, 110(21), 7234-7235. D.S.Calvao, p. m. v. b. B. A. C. J. a., Theooretical Characterization of oligocubane. Synthetic Metals 102 (1999) 1410. Journal of the American Chemical Society / 101.25 / December 5, I979,7441-7457. Galasso, V., Theoretical study of spectroscopic properties of cubane. Chemical Physics 184 (1994) 107-114.
the First Preparations of Pentanitrocubane and Hexanitrocubane. J. Am. Chem. Soc., Vol. 119, No. 41, 1997,9592-9602. P.E.Eaton, Cubanes: starting Materials For the chemistry of 1990s and the New Century. J. Am. Chem. Soc. ;1992;31;1421-1436, 31, 1421-1436. Philip E. Eaton, t. Y. X., t and Richard Gilardi*, Systematic Substitution on the Cubane Nucleus.
. J. Am. Chem. SOC.1993,115, 10195-10202. High-Energy Materials**. Adv. Mater. 2000, 12, No. 15, August 2. Philip E. Eaton, Cubane: Starting Materials for the chemistry of the 1990s and the new century. Properties of 1,3,5-Trinitrocubane and 1,3,5,7-Tetranitrocubane. J. Am. Chem. SOC., Vol. 115, No. 22, 1993,10196-10202. CUBANE: A BRIEF REVIEW. Carbon Vol. 36, No. 5-6, pp. 809-815,1998. Zhang, P. E. E. a. 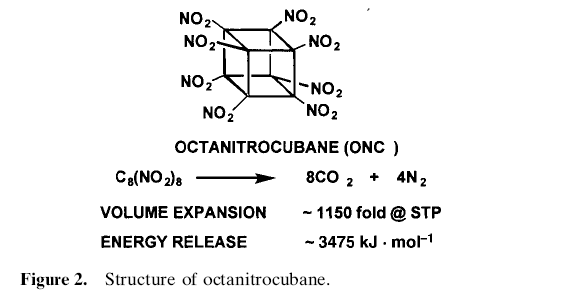 M.-X., Octanitrocubane: A New Nitrocarbon. Propellants, Explosives, Pyrotechnics 27, 1 – 6 (2002).